Aesop is an international care brand from Australia that has an exclusive concept store on the ground floor at Chadstone. The store has the entire product line by the brand, including skin care, hair care and other products. 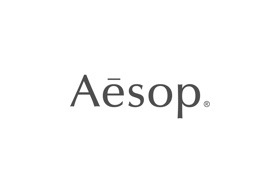 Dennis Paphitis, a professional hairdresser by profession, started Aesop in 1987 as an exclusive skin care brand in Melbourne, Australia. The idea behind starting this brand was to develop high quality products for personal care that were well researched and unique. Over the next 2 decades, the company hired scientists and researchers to create unique blends and formulations in their lab using natural plant based extracts along with synthetic chemicals, all meant to enhance beauty and well being. The brand started off with skin care products, but slowly expanded to soaps, hair care products, fragrance and customized gift sets. The stores are designed as concepts and a lot of thought is put into how they can enhance the overall shopping experience. They are unique concepts that blend in the passion for art the brand has. Each store incorporates aspects of local culture, art and history of the place where the store is located. Each Aesop store is one of a kind that connects to the place and the people.